Trying out new recipes, old recipes, and some of my own. I have always loved baking, cooking, eating, all things food. In the past few months, I’ve been trying out so many new recipes, revisiting old favorites, and even developing a few of my own. So I have decided to take to blogging about my food experiences. 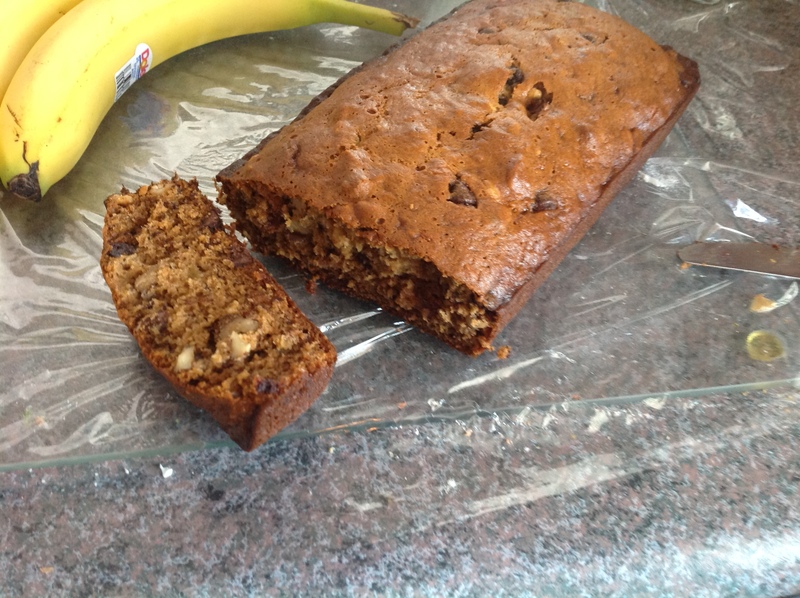 In honor of the name of this blog, my first post is banana nut bread. I made banana bread for the first time about four months ago. Before that, I’d never baked anything with bananas. Okay, well there was this one time that I tried to make banana nut muffins but didn’t have oil or eggs. Surprise, surprise when that turned out to be a complete disaster. Since then, I’d been afraid but my love of all things banana won out when I had four overripe bananas sitting on the counter. I found a recipe on my favorite blog site and couldn’t wait to try it. I adapted it a little bit, though. A Certain Someone has an insane love for chocolate. When I mentioned that I would be making banana bread, his eyes got big and he begged if I could pretty please put chocolate chips in it. Since then, I have made banana bread four or five times and even skipped the chocolate chips once, but that didn’t go over so well. If your bread gets too brown while baking before it’s done, wrap the top in tin foil. Personally, I like my bread a little more crusty so I don’t mind if it gets too dark. This recipe makes two loaves. After letting them cool, you can wrap them in saran wrap and freeze one of them until you’re ready for it. The bread will still be moist after it thaws out. 1. Preheat oven to 350 degrees F. Grease two 8×4-inch loaf pans; set aside. 2. In a medium bowl, whisk together the flour, baking soda and salt; set aside. In the bowl of a stand mixer (or a large bowl), combine the bananas, sugar, oil, eggs and vanilla; mix well on medium speed (or use a whisk to thoroughly combine). Add the flour mixture and mix on low (or use a whisk to combine) until completely blended. Stir in the walnuts. 3. Divide the mixture into the two loaf pans. Bake for 35 to 45 minutes, or until a thin knife inserted into the center comes out clean. If the loaves begin to get too dark before they are done in the middle, cover with foil.